Virtualization solutions on Sun are classified as soft or hard partitioning solutions, meaning that some Sun technologies can be used as a technology to license the sub capacity of a server. But not all of them. What Sun technologies are considered soft partitioning and what technologies are considered hard partitioning? 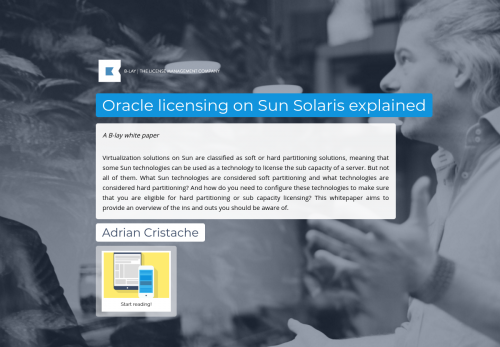 And how do you need to configure these technologies to make sure that you are eligible for hard partitioning or sub capacity licensing? This whitepaper aims to provide an overview of the ins and outs you should be aware of.